So if Chan Marshall at Wal-Mart represents a thread to indie rock, what does it mean when Audioslave shows up in my iTunes? Don’t blame me; blame my next-door neighbor: “Ronny” is leeching my wireless Internet! Ever since he made himself a part of my local network, “Ronny’s shared Limewire music” has appeared as an all-new iTunes playlist. Take a gander at his playlist in all its glory, then come back here. If you ever doubt that you have good taste in music, print out this picture and tape it to your wall. Look to it as a daily affirmation: you do not live in an arid, classic rock wasteland. 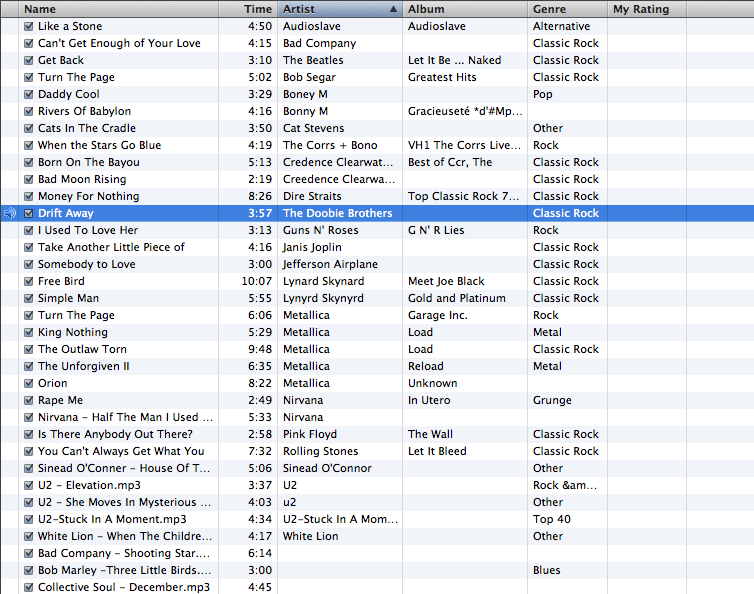 I’m also glad my iTunes library is carefully maintained. I don’t blame Ronny for the misspellings, the mislabeling, even the dubious formatting of the word “Rock and Roll.” This is all Limewire, after all; the music comes to him as garbage. Still, I look at what’s there and I cringe. Ronny, doesn’t this sloppy information bother you? Doesn’t this music? Then there are the misspellings. I do hold out hope for the tape deck. And the Creedence! And sweet Jesus, Sinead O’Connor‘s name is spelled differently within the same track! It requires hard work to make things that bad! Ronny’s version of “Free Bird” is off of the Meet Joe Black soundtrack! Seriously? Did Anthony Hopkins pull off some whammin’ air guitar in that movie? Only Ronny knows. Too bad he’s getting kicked off the network. Come on, the guy has a White Lion album! Oh, iTunes, you raise my hopes and dash them! I see this ad on the iTunes Music Store and think: “Ooh, free Bowie! And besides, the bigger artists on iTunes only get featured for their Celebrity Playlists. Which, come to think of it, haven’t been so prominent lately. And do you know why? iTunes now offers so much more! Hair metal music videos! Terminator movies! All sorts of things which make the iTunes Music Store far less of a cool music destination and much more like just another FYE. I was at a party two years back, and for some reason, someone started talking about Andrea Bocelli. After a few minutes, one of the partygoers, apparently jealous and suspicous of the singer, shouted out: “That fucker can see!” I’ve been unable to keep a straight face while looking at Bocelli since. So thanks a lot, iTunes Music Store; now I can’t visit until you rotate off that ad. Comments Off on That Fucker Can See! You know what, though? I like how every iTunes Music Store reviewer is a smartass…. Comments Off on The Commish is Delish!